Sensational 7-9 day trek high into the Sikkim Himalayas, close in to hulking Kangchenjunga, the 3rd highest mountain in the world at 8,586m. If you only go as far as Dzongri (at around 4,000m), you will get 90% of the views and excitement for less altitude suffering - and less time. 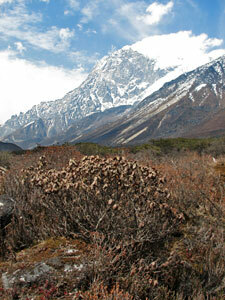 This is a very tough walk in high, remote mountains where altitude can cause real problems. Come prepared. Porters nigh on essential! 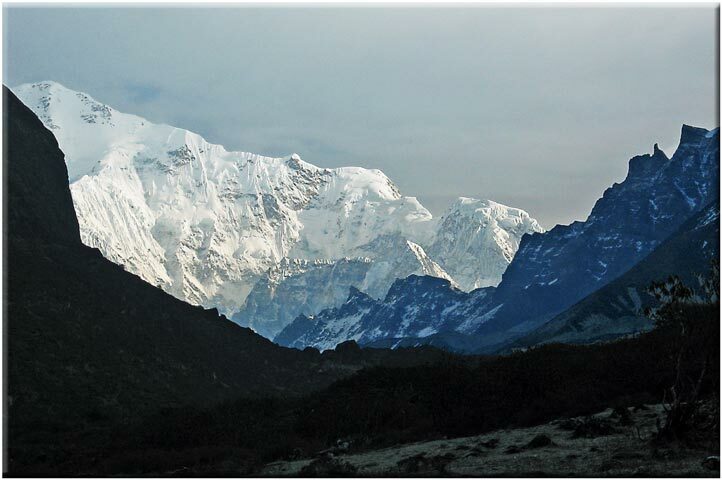 The Goecha La is perched on a high ridge a mere 5km from Kangchenjunga's east face, a miraculous place of huge views and prayer flags. 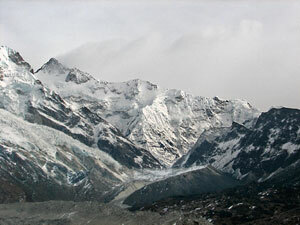 The 7 to 9 day trek there and back is tough, rising (steeply in places) to 4,940m. 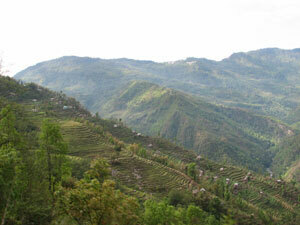 From the roadhead at Yuksom, a long day takes you through thick and leechy forest up the steep Rathong Chuu valley, the next labouring up through rhododendron forest to the high ridge and outstanding views (some say as good as they get in the Himalayas) at Dzongri. Thereafter, possibly after a rest day, the trail ascends the ridge before dropping steeply into another gorge, then climbs back to the high country and wondrous views. 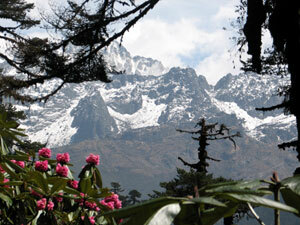 Two days, the intermediate night by a lovely lake, get you to the Goecha La. 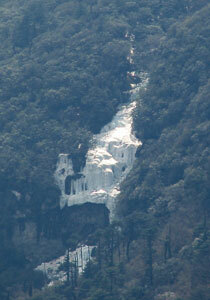 You should be able to get back to Yuksom in 2 days. If you only go as far as Dzongri (at around 4,000m), you will get 90% of the views and excitement for less altitude suffering - and less time. 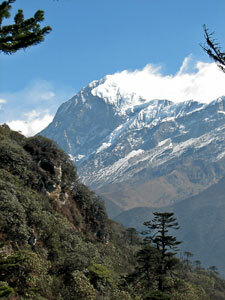 You could do a Zongri trek (including a day there) in 5-6 days. 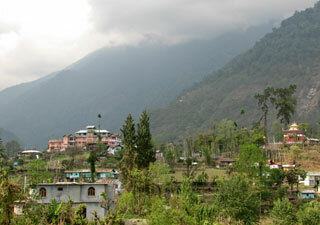 See extracts from David Briese's excellent account of his time on the Ridge, below, or the full text at www.gang-gang.net/nomad/sikkim/Sikkim03. 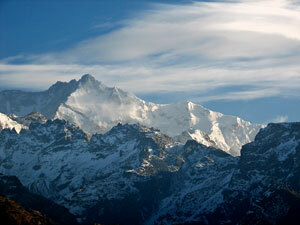 See our Kangchenjunga / Singalila page for more information. David Briese: Walkopedia would like to thank tramper David Briese, based in Oz, for access to his personal account of this magnificent trek, walked with friends. See the full blow-by-blow description and more in his fantastic website www.gang-gang.net/nomad/sikkim/Sikkim03 (in two parts). We love it! 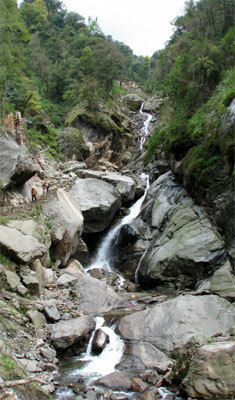 The track followed the valley of the Rathang Chu, traversing its steep sides through the green wonderland of Sikkim's forests - greens of every shade and texture surrounded us as we undulated and meandered along the track, crossing the odd sidestreams flowing down rocky gullies, and slowly gaining altitude as we were accompanied by the distant sound of the Rathang Chu rushing down over its boulder-strewn bed. A short steep drop brought us down to the Prek Chu, with its narrow suspension bridge seemingly held up by a myriad of fluttering prayer flags. 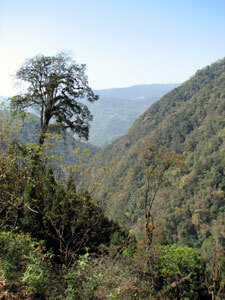 The bridge also announced the start of a long zig-zagging climb 450m up a steep ridge into the cloud forest. We climbed slowly up under a canopy of lichen- and moss-covered monkey-nut, chestnut and oak trees, often growing amongst a jumble of mossy boulders. Suddenly, the huts of Bakhim appeared - we had reached 2700m and, after climbing more than 1000m, were glad to see our campsite on a grassy flat (well almost flat!). 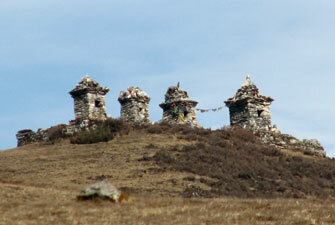 We zig-zagged up through the open forest along a steep ridge line heading up to Tshoka, a small Tibetan village. 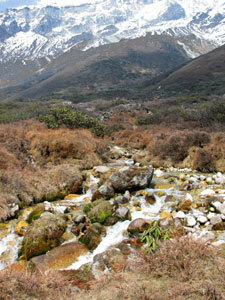 Across the deep valley was the snow-capped jagged line of mountains leading up to Jopunu (5950m) and Pandim (6690m). A few more metres in height and we arrived at Tshoka, for a welcome cup of hot chai at a Tibetan teahouse - 300m down, 700 to go! Leaving the village we again climbed steeply for another 300m to reach a narrow ridge line. 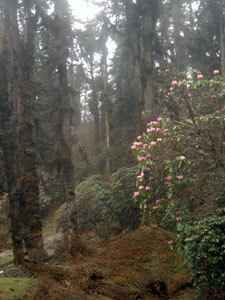 Here the track flattened out, following the ridge lined with a magnificent display of flowering rhododendrons. One more upward assault on the ridge and we emerged at Phedang meadow (3700m) - a sloping barely grassed camping area scented with the earthy waft of dzo dung. The cooking team had beaten us up there and we were greeted with a welcome cup of hot orange and a steaming hot lunch, which we enjoyed while basking in the warm sunshine and taking in the panorama of the snowy outline of the Singalila Ridge to the west and Jopunu to the east. Unfortunately it was once again "ukalu, ukalu" - upward, upward! Leaving the meadow at Phedang we climbed slowly up through the increasing stunted rhododendrons, the fir trees becoming smaller and scarcer until they vanished - we had reached the tree line. 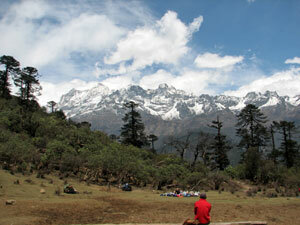 Finally, at 3995m, we emerged onto a prayer-flag lined view point. 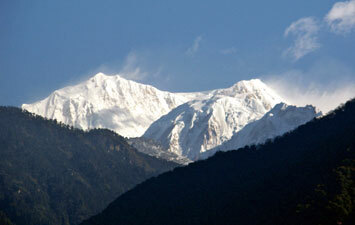 A wide panorama of the mountains suddenly appeared as we topped the ridge; Janu, Rathong, Kabru, Kangchenjunga, Pandim, brilliantly white in the morning sunshine, with the sharp black tooth of sacred Kabur a sharp silhouette in front. At last we were able to descend for a while, through the cream flowering rhododendrons and grassy clearings, a short climb to over 4000m and then another descent to the trekker's shelter at Dzongri, a vast exposed region carpeted with low brown juniper bushes and prostrate conifers. From here it was but a short climb (though at this altitude, short seems long!) to our next campsite. 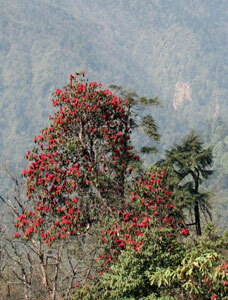 This morning we were climbing up to Dablakhang, a hill 150m above our campsite, to see the sun rise over Kanchenjunga. Descending back to camp, we breakfasted in the morning sunshine, and then set off for a short climb across the kneehigh juniper and conifers of the Dzongri basin, climbing slowly at first and then descending past a herd of grazing yaks. 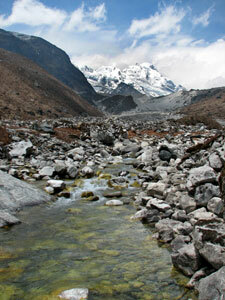 A short detour took us to Laxmi Pokhari, a small glacial lake in a bowl at the base of Kabur. To the north-west, the impressive form of Pandim framed the dark green waters of the lake. We followed the Prekchu upwards, before finally crossing it and continuing our climb along the rocky lateral moraine of this perfectly formed glacial valley. 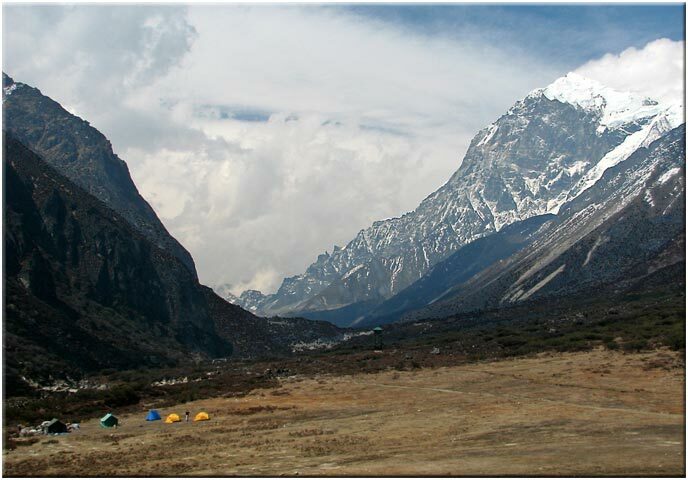 Finally we crested a rise in the moraine to see below us the broad grassy meadow at Thamsing - our tents were just being erected and behind them, almost 3000m straight up, the rocky western ramparts of Pandim towered above. Today was a short climb up the gently sloping valley floor, across a rocky landscape of low alpine heath and the occasional babbling sidestream. 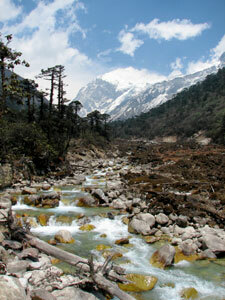 Soon we reached another area of sloping grassland, set beneath a large rocky wall of moraine, alongside the fast-flowing greeny-yellow waters of the Prek Chu, only a few kilometres from its glacial source. 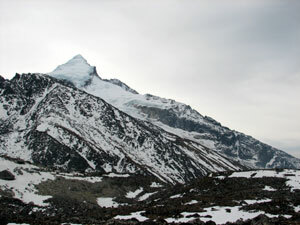 We had reached our highest campsite (4130m) at Lamaney. We put on an extra layer of clothing as we climbed up the rocky moraine and then descended into the bowl holding the dark turquoise waters of Samiti Lake (4300m) - the lake of small blessings. 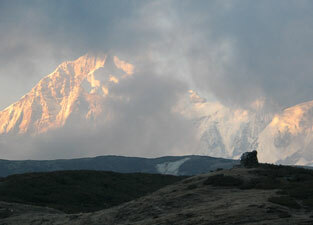 It was time to get up to head once more up the valley to watch the sun rise over Kangchenjunga. Today's goal was a viewpoint at 4600m and a few kilometres further away from the 8586m peak; not as close [as Goecha La], but still right in the heart of these great mountains. 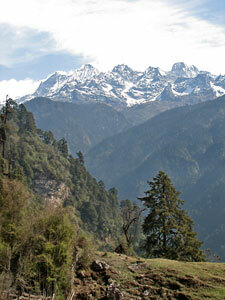 Heading off, we soon reached Lake Samiti again. We pushed on, slowly climbing the last 300m, lungs gasping in the thin air, to a point overlooking the enormous glacial bowl below Goeche-La. With regret we eventually turned our backs and headed back down, past the still mirror-like waters of Lake Samiti and down to our campsite at Lamaney. Our descent did not stop there. We headed down across the alpine heath and babbling streams beneath the long snow and ice capped ridgeline, over the Thamsing meadow where tents were already popping up for the next wave of trekkers, down the steep moraine and through the jumbled mossy boulders and stunted rhododendrons, and into the firs that line the lower Prek Chu. Day 7: Kokchurong to Tshoka – a walk in Narnia! For the first two hours of the day's trek we wandered through it, half expecting a faun or the ice queen to appear at each corner. 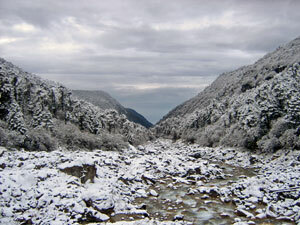 However, nothing disturbed the stillness apart from the occasional fall of snow from a branch. On occasion, more snow fell gently, while snow-capped pink, red or cream rhododendron flowers or a purple patch of primulas lent the odd touch of colour to this beautiful monochrome forest. Later we started the long descent to Tshoka, 700m below. Soon we found that the track had turned into a muddy brown torrent of water - the erosion on parts of the track here is becoming quite a problem. Day 8: Tshoka to Yoksum – back home again! On our final trek day, during which we would retrace the steps of our first day out, dawned to grey foggy skies and sleet. 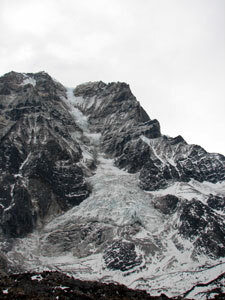 We descended quickly, like automatons, and half way down the 750m descent to the Prek Chu the rain finally stopped. 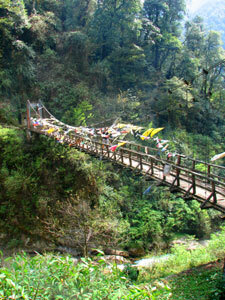 At the Prek Chu suspension bridge, we took off our wet weather gear and continued on feeling a little more human. It was a curious sensation descending this track that we had climbed a week earlier. It seemed too quickly that we emerged from the green Sikkimese forest and wandered down the back streets of Yoksum, finishing as we had started, in T-shirts and sunglasses under a warm sun, and contemplating the caprices of the Himalayan weather.